Navy beans and a variety of vegetables. A Greek Tradition! Orzo in‏ rich chicken stock finished with a liaison of eggs, cream and lemons. Mixed greens, goat cheese, candied walnuts tossed in a raspberry wine vinaigrette and finished with sliced warm beets. Served with foccacia. Tomatoes, cucumbers, red onions, green peppers, olives, smothered with grated feta cheese and finished with olive oil and oregano. Served with pita. Romaine lettuce, kefalotyri cheese, our own croutons and Caesar dressing. Served with foccacia bread. Yogurt, shredded cucumbers, garlic and oil served with pita. Chick peas, tahini, spices, oil and lemon served with pita. Traditional pink caviar pate served with pita. Tzatziki, homous, taramasalata served with pita. All dips are served with two pieces of pita bread. Grapevine leaves‏ filled with ground sirloin and rice, perfectly spiced. Tiger prawns sauteed in garlic butter with a dash of white wine served with both garlic butter and tzatziki. Pan fried chicken livers perfectly spiced and deglazed with red wine. 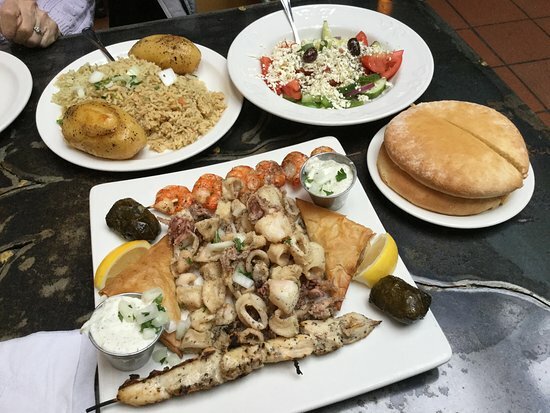 All above come served with tzatziki and pita bread. Spinach, caramelized onions, green onions, dill and feta cheese folded into a filo crust. Served with tzatziki. Kefalotyri cheese pan fried, served hot with half lemon and pita. Kalamaria, dolmades,‏ spanakopita, homous and tzatziki. Served with two pita bread. Ce restaurant a fermé il y a plusieurs mois sans prévenir! ! Si quelqu'un sait pourquoi il a fermé, veuillez partager. Nous avons adoré Paros. C'était notre aller au restaurant. Le personnel était toujours très sympathique. Excellente cuisine, service exceptionnel, côtés supplémentaires! Nous y sommes allés pour le déjeuner et nous avons pris un repas frais avec un service attentif et prévenant. Le restaurant est en fait à Burnaby près centre commercial Lougheed et ça vaut le coup de s'aventurer si dans le quartier. Bon restaurant et cuisine ? Un régulier depuis des années une ou deux fois par mois. C'est vraiment comme des membres de la famille, je n'ai jamais eu un mauvais repas, le service est toujours super. Une véritable ambiance familiale. Toujours hâte de notre prochaine visite. Obtenez des réponses rapides du personnel et personnes ayant visité le Paros Taverna.